1 mL Syringes are general purpose syringes for diabetic, tuberculin and other uses including post-operative conditions, vitamin deficiencies and intramuscular medication. Manufactured by Becton Dickinson, 1 mL Syringes (1 cc Syringes) provide a choice of Luer-Lok® Tip or Slip Tip. These single-use syringes can be fitted with either conventional or safety needles. 1 mL Syringes are in an easy-peel blister package. 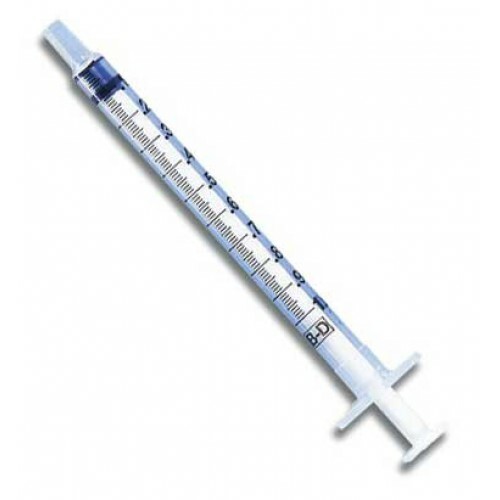 If you are looking for the 1 mL Tuberculin syringe with needle, we carry those too. Features bold, clear scale markings to assist in making easy and accurate dosage measurements. Thinner and smaller syringe size is easier to control. 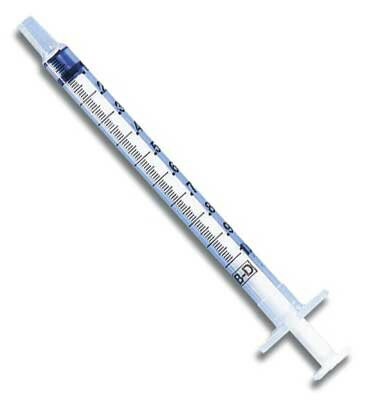 BD 1 mL Oral Syringe Product ID Numbers: 309628, 309659, 329650. Syringe Tip Options: Slip Tip, Luer Lok Tip. Syringe Capacity: 1 mL or 1 cc. Syringe Capacity Graduations: 0.01 mL increments. Could these be used for vaginal contraceptives? What is the difference between a Luer Lock tip and a slip tip? Luer lock tips have a small threaded area in order to attach to an item such as a tube. Slip tips do not have such an end area. I had wanted BD, but couldn't find them with Luer Loc, but couldn't find them on Amazon. Settled for another brand and they were terrible and the plunger got stuck. Just locked up. I found these and ordered them. They actually arrived in two days. Very happy with service and BD syringes are the best. They are high quality precision syringes I love them. 1 ML best for small amounts. They're exactly as advertised and each order I've made so far have had the correct counts. It also shipped significantly faster than the estimated time at checkout, will definitely be returning ever time I run out. Use them for intramuscular injections <1cc. Needed a 1mL Luer Lock syringe, it had to be BD specifically (for the diameter of the syringe to fit in an auto-injector I have,) and this was the easiest and cheapest site that offered them without the need for some sort of account. Shipping was also faster than expected. Simple product - I needed the Luer lock feature. Payment & delivery were fast & easy. A good deal on just what I needed - these are used for medicating our cats. great product, syringes are high quality and slide with ease. Numbers are dark and easy to read. We order these often, they are a great product. When pushing thick fluids, plunger can disconnect. Easy to use,I'm dosing a small dog and it's working perfect.